At Big Pine Trout Farm, every day is opening day. You will enjoy fishing on Meadow Creek, a swift, challenging, natural mountain stream cascading through the property with natural obstacles to make your fishing vacation one to remember. 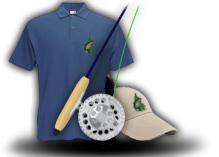 Anglers frequently hook into wild and stocked trout in the course of the day a great crossover for our Tenakara and Fly Fishing Anglers. Meadow Creek is a resource sensitive facility with seasonally available stocked Rainbows over 2 lbs. and some that can be 3 lbs. or better. These Rainbows are hard fighting and a challenge to catch even for the experienced angler. If you are lucky you may encounter one of our native brookies or reproducing rainbows. Big Pine offers a superb private group or corporate experience and because we allow only entire stream rentals, reservations are required! Our Daily Stream Rate allows up to 6-7 Anglers but you can reserve a slice of Appalachian Heaven for your small family or best clients! Reserve Early. RESERVATIONS ONLY! $500.00 rents entire stream from 8AM-3PM!